When we think of rubber stamps being used in business, images of 'paid' stamps or other administrative stamps spring to mind. There are many other ways, however, that rubber stamps can be used in businesses other than as a piece of office equipment. Rubber stamps are a useful way for small businesses to build a brand image. While larger companies have budgets that allow them to get literature printed with their brand which can be used for promotional purposes, small and start-up companies often do not have the money to be able to do these things. Rubber stamps are a great way for small businesses to be able to literally make their mark on products and services. Stamps can be used in many ways. Small businesses selling handcrafted items specialize in the one-off nature of their products and want to steer clear of anything that looks mass produced. Commercially printed literature can not only lose that handcrafted feel but can also be expensive. Stamps are a great low-cost way for craft businesses to be able to project a brand image without looking too commercial. Many handcrafted products benefit from a label giving ingredients or aftercare instructions and a simple, stamped impression can help give a professional feel to even a handwritten label without looking mass produced. Simple envelopes can be customized with a stamp and this can be the logo of a company or perhaps the website address. This is also a useful way for sellers on websites such as eBay and Etsy to brand their service. A stamp can be used to customize the packaging and delivery note, or simply on top of a 'thank you for your business' note. This is a useful way to help build brand awareness with customers and for them to remember the business name in the future. A rubber stamp can be used to customize promotional literature such as Christmas cards or marketing postcards. 'Off the shelf' literature can be purchased at reasonably low prices and customized with a rubber stamped image. Simple black and white business cards can be customized with a stamped logo, this can be a cost-effective way of branding low-cost business cards and is great for small or start-up businesses. Rubber stamps with the company website address and logo are a useful item to have to promote a website or web-based business. A self-inking stamp is easy to carry around and instead of having to write down details for someone or fumble around for a card, the information can be quickly stamped into a notebook or other piece of paper. 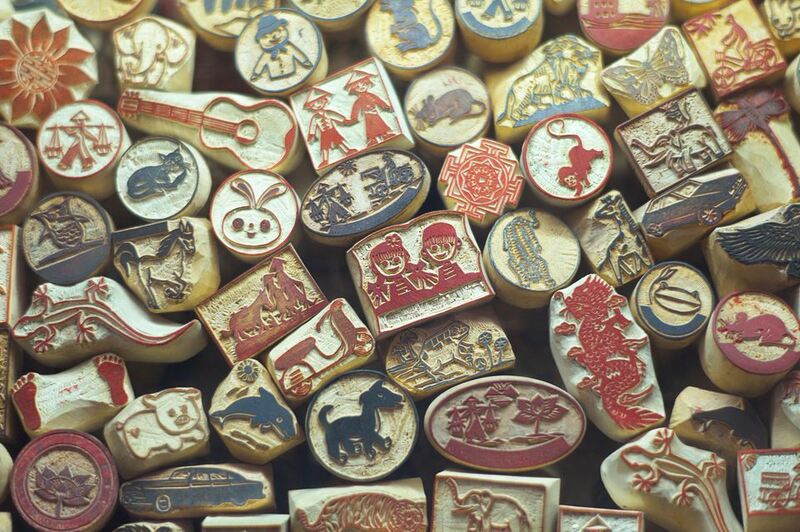 Many stamp making companies will create custom stamps. Companies such as VistaPrint allow customers to upload their own designs or offer a design service. The process for customizing stamps is extremely straightforward and the website walks customers through each step of the process. Another great place to look for customized stamps is Etsy, the website dedicated to all things handcrafted. Here, a wide range of sellers offers custom stamps which can be purchased online. You will find a range of contemporary business stamps as well as a range of customizable stamps. These include stamps such as 'hand knitted by' (see picture)' from the kitchen of', and 'hand sewn by' labels. Advice is given by many sellers explaining how to order customized stamps. Some smaller or independent stamp companies are also happy to work with people to create the perfect stamped image and can produce stamps in a range of custom sizes. In addition to creating a whole new image, many companies have a range of standard designs that can be customized. This is an ideal midpoint and is a cost-effective way to create customized products without the cost of a full design service.